Birds on Tap: Gulls and Growlers! 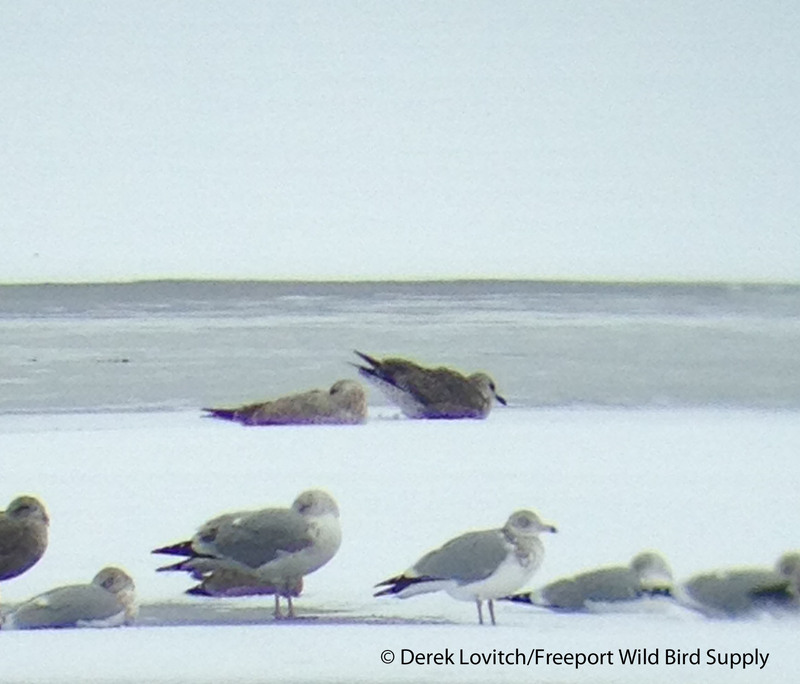 With windchills around -15F, even the gulls looked cold today. And there’s no way to sugar-coat it: it was brutally cold. The coldest temperatures in over a month – and one of the coldest days this entire winter – greeted the start of the first edition of the “Gulls and Growlers” tour in our “Birds on Tap – Roadtrip!” series with our partners, The Maine Brew Bus. Donning plenty of layers, we hit the road and headed north to an unusual destination – well, only unusual if you’re not really, really into serious birding: the Hatch Hill Landfill in Augusta. And the swirl of birds that greeted us quickly explained why we were here on this bitter day. 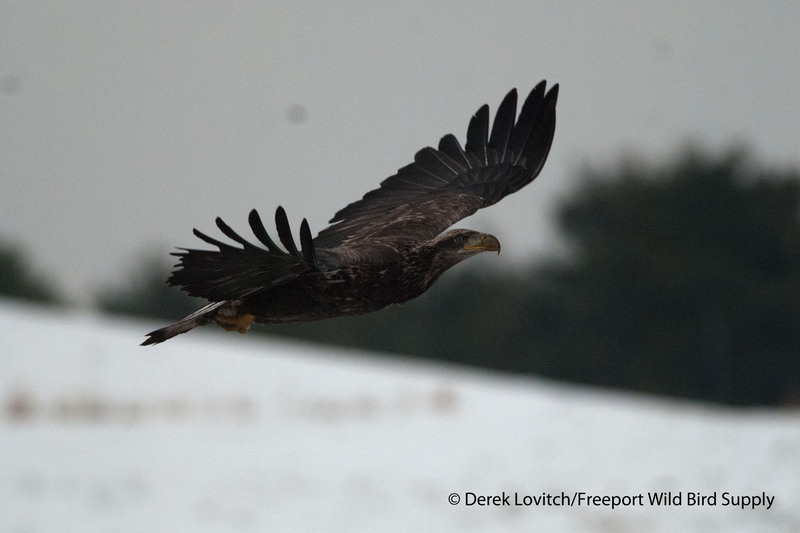 1,000-1,500 Herring Gulls (with a few Great Black-backed Gulls sprinkled in) would rise up in a swirling cloud every time one of the 8-10 Bald Eagles made a close pass. Add to that 500 or so American Crows and a few hundred European Starlings, and you have a lot of biomass! We learned a little about aging of eagles as birds passed overhead and perched in the towering pines behind us. We sorted through the masses of gulls for any unusual species, and the sight of so many birds in one place allowed for us to forget about the cold – at least for a moment. My original plan was to spend 1 to 1 ½ hours here, watching and photographing eagles and studying gulls, hoping to tease out a rarity or at least foster an appreciation for just how approachable gull identification really is. But I’m also at least somewhat rational – well, unless I had spotted a rare gull! – so we knew when to say when and boarded the bus for a short ride to one of the local gull roosts. At least 300 gulls were present, with dozens arriving every few seconds, so it would have been the perfect opportunity to carefully sort through them. Unfortunately, the 20+ mph wind was directly in our face. We soon moved on. After a quick coffee/hot chocolate/bathroom stop – perhaps the most welcome stop of the day! – we shifted gears a bit and focused on the Kennebec River. Starting at Mill Park on the north side of Augusta’s downtown, we made several stops as we traveled south to Gardiner (often using the bus as a windbreak!). 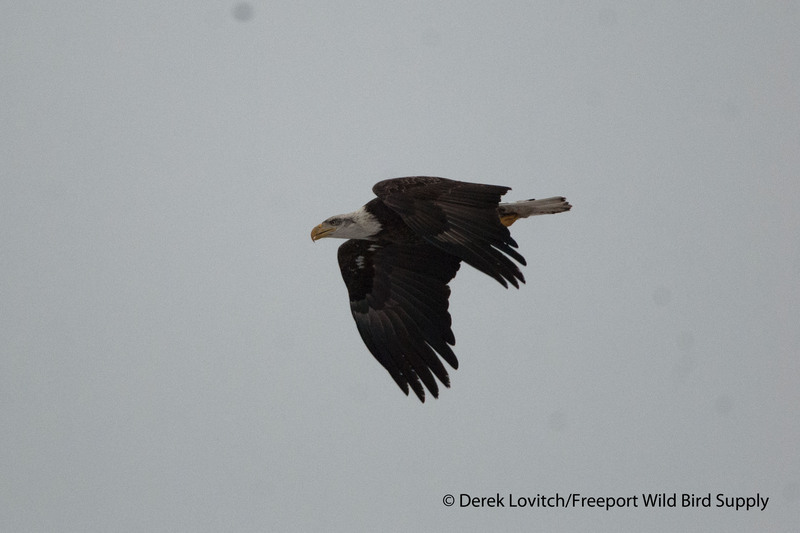 In doing so, we spotted at least 4 more Bald Eagles, and a tallied 132 Common Mergansers. In fact, the mergansers stole the show today, with several rafts actively displaying and some birds fishing in close proximity, diving into the strong current and surfacing between chunks of ice. It was a good count for this time of year, but we enjoyed uncommonly good views of many of the birds. 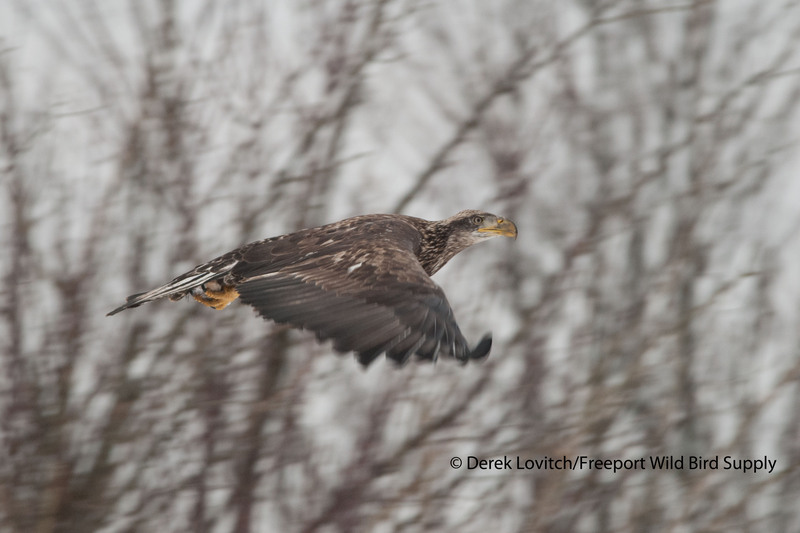 We checked through a few small groups of gulls – mostly Herring and Ring-billed as expected – and even though we were freezing, we were reassured that spring is right around the corner thanks to the Turkey Vulture that was weeble-wobbling its way through the gusty winds over Gardiner. Mike, our driver and beer guide for the day, took over as we traveled between our last few birding stops, offering an abbreviated history of alcohol in Maine, and for a dark period, lack there of. Maine was at the forefront of the Prohibition movement, but now, we are back at the forefront of local, innovative, and cutting edge production of beer, cider, spirits, and much more. Our first stop in the beverage half of today’s tour was Lost Orchard Brewing/Crooked Halo Cidery where David Boucher and his father, Nick are doing some really “crazy” things with hard cider. By using all sorts of different yeasts and adding lots of creative ingredients, David is working to make “a traditional style untraditional” with his self-admitted “mad science.” And speaking of untraditional, their repurposing of an old church as their tasting room – complete with a bar on the alter, which Nick constructed from the wood of old pews – made for a very unique place to visit. They even offered to turn the organ on for us! Closed to the public in winter, they opened their doors just for us, and treated us to some special drinks. In fact, we were the first members of the public to sample their new Exodus, a McIntosh apple cider fermented with farmhouse yeasts and Brettanomyces, which made for a well-balanced cider that was just tart, sweet, and dry enough. Genesis was drier, “more like an apple wine,” and Hellfire – a strawberry-jalapeno-infusion – played with our taste buds with sweet strawberry up front and a jalapeno burn on the back end. Sour Sister used sour cherries and four strains of souring yeasts, and then David dipped into their private reserve to tantalize us with Dante’s Inferno. Aged in cinnamon whiskey barrels loaded with cinnamon sticks, this is my new favorite cider – and one of the favorite drinks of the day for the group. Our only complaint was that they didn’t have anything bottled for sale at the moment; I know I would have left with a case of Dante’s Inferno! Heading south, our second stop was the brand-new Flight Deck Brewing in Brunswick. This was another special treat for the tour as they opened a mere two weeks ago, and we were the first tour group to visit. And we immediately saw first hand how well it has been received by the community, as the place was packed – as it has been since the day they opened; over 5,000 people were served in their first week alone! Another really cool renovated building, Jared and Nate’s burgeoning brewery is housed in the former indoor small arms range of the Brunswick Naval Air Station. The path is paved with cement blocks cut from the walls to install windows, and they have an entirely electric, seven-barrel brewhouse run on 100% renewable energy from the old base’s micro-grid powered by solar and biomass. Head brewer Jared described the process and their brewing philosophy, while Nate joined us to describe their unique system, location, and goals for the new business. Meanwhile, we sipped a few of their delicious beers. We started out the Pilot’s Porridge Oatmeal Stout, a “session stout” that was light in body compared to many stouts, and fairly low in alcohol, it still had the flavors we know and love in stouts. Our next beer was 44th Parallel IPA, a traditional and straightforward IPA, and one that will no doubt be a standby for locals. But for me personally, both were overshadowed by the Irish Breakfast. A pale ale base with a day-long steeping of Irish breakfast tea made for a unique and fun beer. The tea definitely stood out, but its bitterness and herbaceous-ness was balanced by a sweet, malty backbone. I’m getting into some of these tea-beers, and I think this is a solid effort (they were already out of their Hibiscus Tea beer that was my favorite on a recent “scouting mission” here). 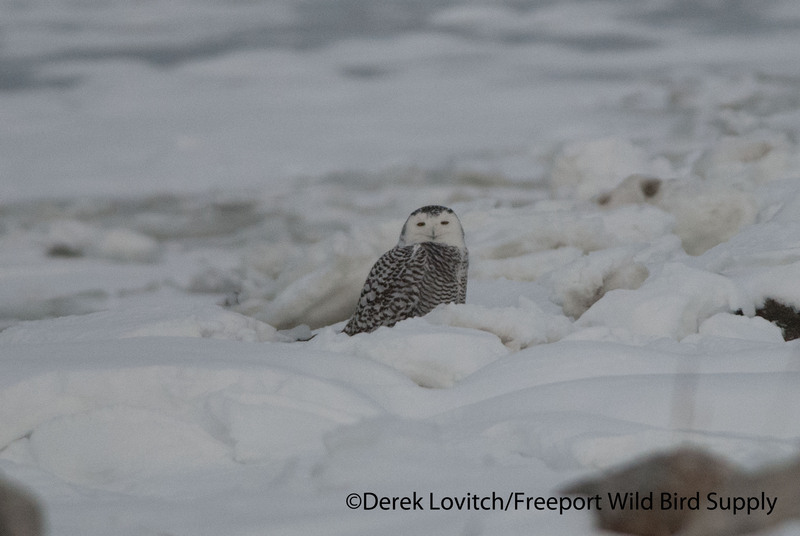 Winds were still howling, and temperatures- believe it or not – were dropping again, so we decided to forgo a search for Snowy Owls (none had been reported recently here, or we would have definitely cowboyed up!) and head home. While learning that Portland (well to the south of our sojourn today) reached a mere 17 degrees above zero, setting a new all-time record-low high temperature for the date didn’t make us feel any warmer, it certainly proved we earned our afternoon beverages! While I can’t control the weather, or the birds, I do love the Birds on Tap – Roadtrips! because I know the beverages will always be there for us! And I believe this was a great itinerary that I look forward to leading again next year…hopefully with a few more degrees on the thermometer (and a little less wind!). I have a feeling it will be warmer on the next eight Roadtrips we have in 2017, starting with the annual favorite, “Spring Ducks and Draughts” on Sunday, April 2nd. Oh, and by the way, as of today, there are only two spaces available! I hope to see you aboard one of our unique and exclusive trips, all of which are listed on our website. 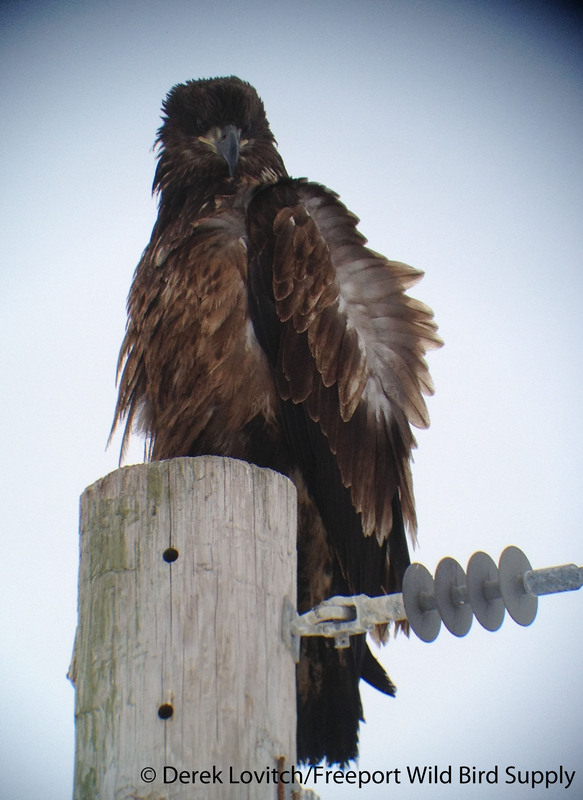 This entry was posted in Birding in Maine, Birds on Tap - Roadtrips and tagged "Birds, Augusta, Bald Eagle, Birding, Birds on Tap, Birds on Tap - Roadtrip!, Brunswick, Common Merganser, Crooked Halo Cidery, Flight Deck Brewing, Gardiner, Hatch Hill Landfill, Herring Gull, The Maine Brew Bus on March 16, 2017 by Derek. Random Photos Using SLR and Phone-scoping Techniques Over the Last Few Days. Over the past few days, I have squeezed in a healthy amount of birding, giving the season and a life in retail! It has been fruitful birding, too, and I posted daily highlights to our store’s Facebook Page for the complete story of recent birding outings. I also took an unusual amount of photos for me. I’m really not a bird photographer. Instead, I call myself a “birding photographer.” I even wrote an article for the recent Birder’s Guide to Gear from the American Birding Association about techniques of birding photography, from traditional digital SLR’s to phone-scoping. In the past few days, I have employed both techniques to grab some photos while birding. Some are better than others, and some are nothing more than “documentation” shots. In the shots below, I employed either a Nikon D80 with a 300mm F4 lens and a 1.4x teleconveter, or a iPhone 4s coupled with a Zeiss Diascope T*FL 65 using a Phone Skope brand adapter. Unfortunately, fairly thick cloud cover on both days impacted my lame photographing attempts. Please remember to double-click the photos to get a larger image. Yesterday, Luke Seitz, Maegan Krieger, and I met at Back Cove in Portland. 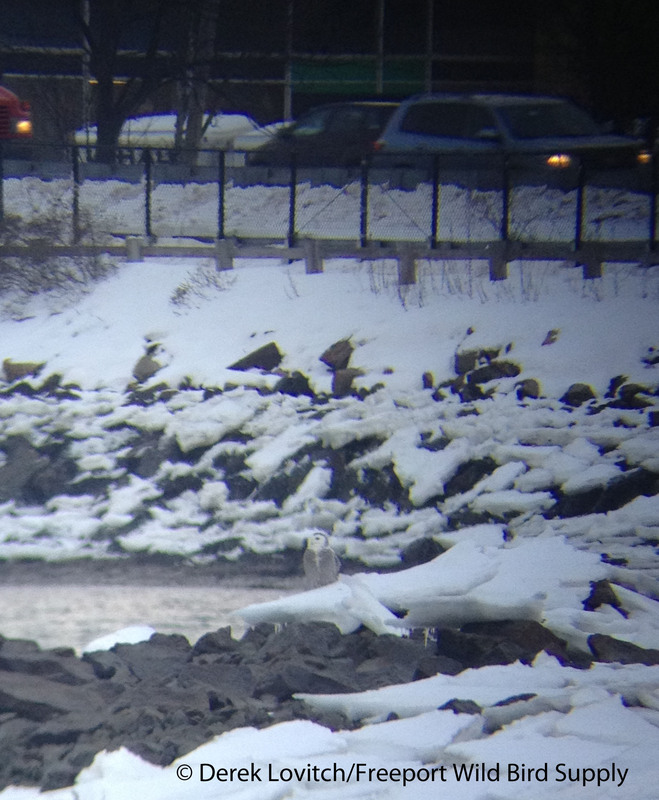 While waiting for their arrival, I spotted this Snowy Owl, and phone-scoped it early in the morning. When we returned to the parking lot around 2:00pm, the day was marginally brighter, and the bird was significantly closer. We used an excersize wall in the playing field as a very convenient blind, and I went to the SLR. 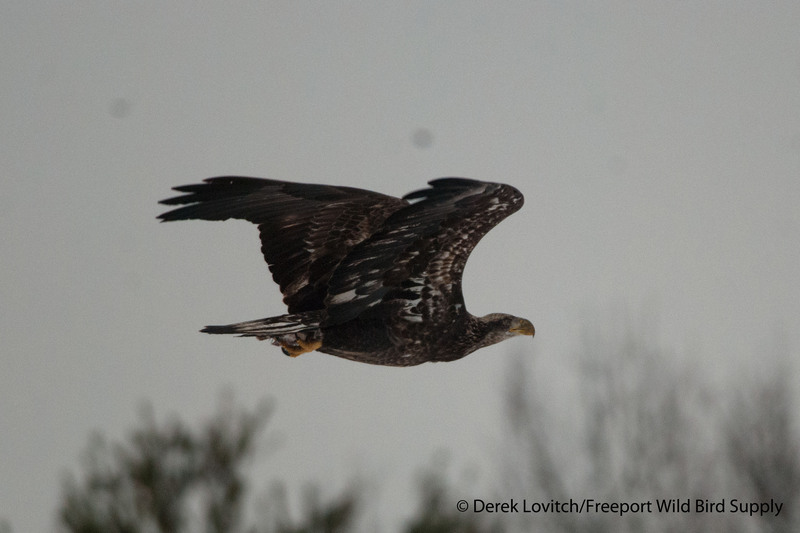 Upon our arrival at Pine Point, this 1st-year Bald Eagle landed nearby. 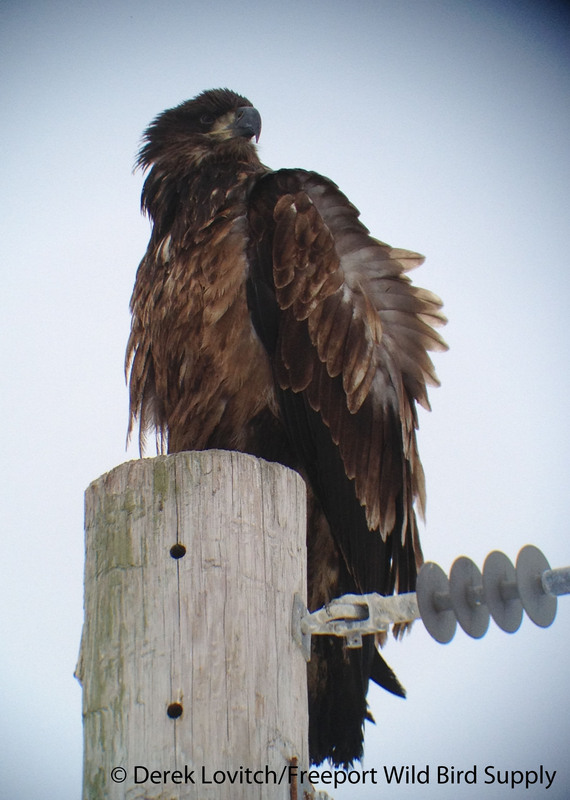 I was without the SLR, so I snapped these photos using my phone-scoping system! 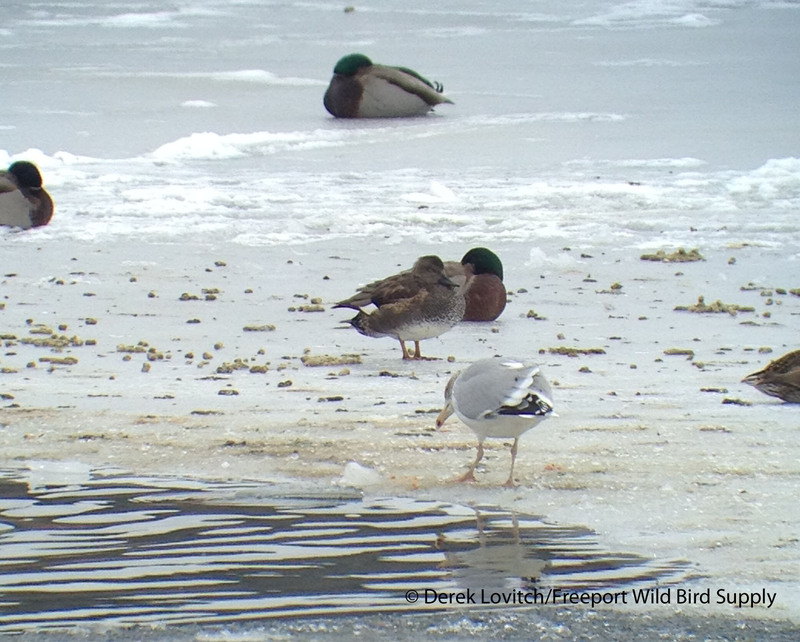 We also found some good birds during the course of the day, including these treats at Grondin Pond: a 1st-winter Lesser Black-backed Gull and a male Gadwall – both of which were phone-scoped. 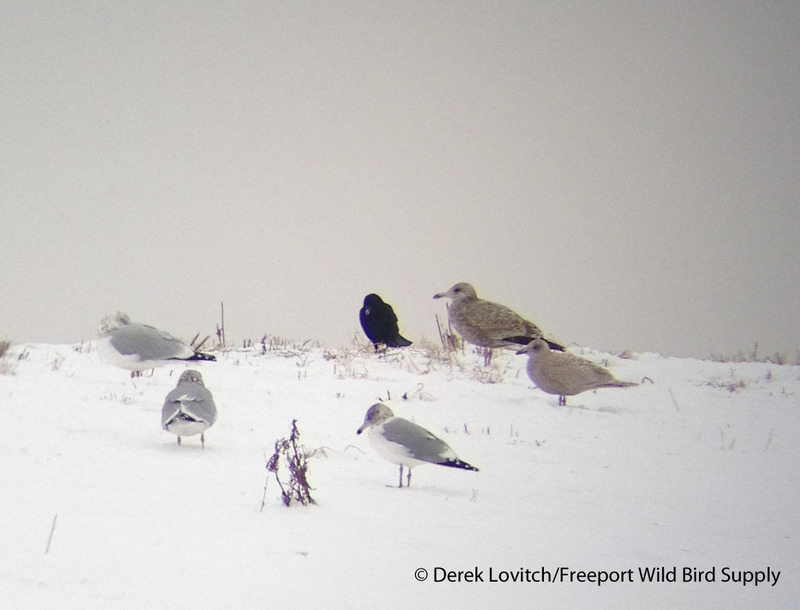 This morning, I visited the Hatch Hill Landfill in Augusta to study gulls, such as this rather dark 1st-winter Iceland Gull, which I phone-scoped on top of the hill. 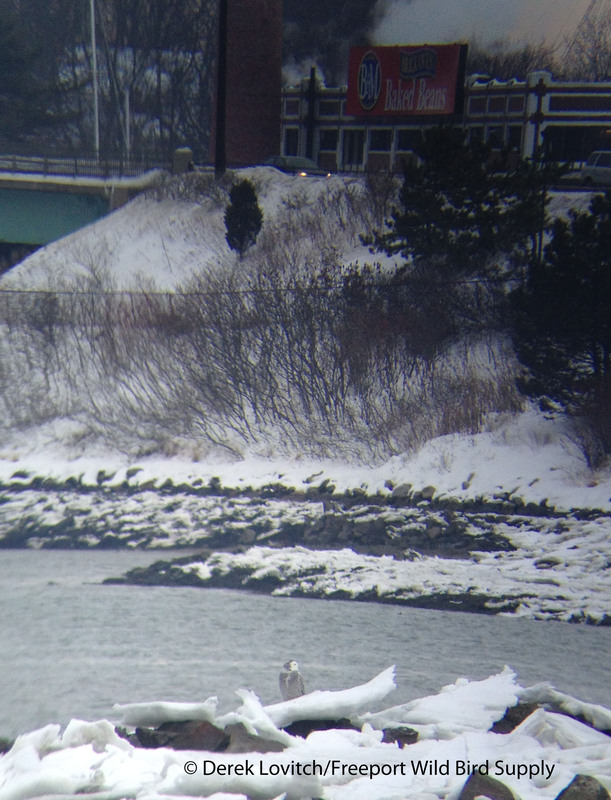 This entry was posted in Birding in Maine and tagged Augusta, Back Cove, Bald Eagle, Birding, birding photography, Gadwall, Hatch Hill Landfill, Lesser Black-backed Gull, phone-scoping, photography, Portland, Snowy Owl on December 20, 2013 by Derek.